We have been installing fences since the beginning and have a wealth of knowledge in all the different types of fences, the construction process and how you can make sure you are installing your fence in your yard and NOT your neighbors. We will take the time to find out exactly what you are using your fence for and help you pick the fence that works best for you and your budget. 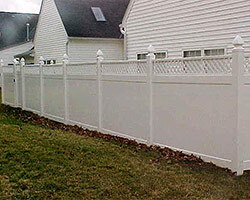 We install custom wood fences, vinyl, aluminum, composite and steel. Please take a look below at some of the different styles of fence we install. We can also seal, stain or paint your fence after installation to protect your investment. Feel free to ask us to add that to your estimate. A home looks beautiful with a green garden and the prefect fence to protect that beauty. A fence keeps your pets out and kids safe. That is why having the right fence is important. Well, look no further than Creative Earthscapes. We excel in designing and building fences that suit the ambiance of homes and perfectly matches the architectural style of the house. There is nothing more important than a fence in your garden which defines your space in the neighborhood. They are called the bone structures of your garden. Having a six-foot high wooden fence is a passé and no longer in fashion. We have a huge array of designs to choose from or we can design a new fence for your home from scratch. We believe in using the best materials and workmanship to ensure you get a fence that reflects your personality and taste perfectly. If you like, we also can include artwork to the fence, giving it an exotic appearance. We understand people’s changing tastes and the need to add a sophisticated look to their outdoor spaces. 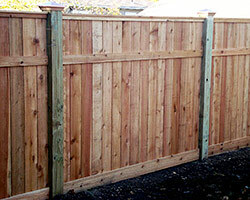 We use advanced materials, like vinyl and treated wood, to give that smooth and fine finish to fences. They are not expensive and can add that superb look to your house. Vinyl is recyclable and it is extremely durable and can withstand all kinds of weather conditions. We find that they are more cost effective than wood. There are hundreds of designs that are available in this category. We can also add additional features, like lampposts and flower creepers to fences to make them more functional and useful. We use other materials, like wrought iron and faux stone along with wood. 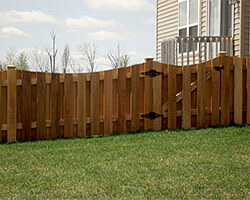 A combination of different materials will add a classy look to the fencing. When you come to us with your specifications, our experts come up with several ideas. They have plenty of suggestions and improvement ideas. You can check our photo gallery for some of the samples that we have created. The entrance or the gates to the house can add a lot of meaning to the whole structure. We create a dramatic entrance starting from the gates of the fence. There would be an element of mystery and surprise right at the entrance. While designing the gates, we keep in mind the designs of the doors and windows of the house that overlook the street. We are good at creating the perfect harmony between design and beauty for your garden. We also incorporate natural materials, like bamboo to add meaning to the entrance. A lovely gate with a beautiful archway can redesign the entire looks of your garden. The gates are further decorated with creepers and flowering plants. We can add stunning trellises to gates to redefine the looks of the fencing. Using contrasting colors is highly in fashion. We know the latest trends and vogue in outdoor designs and at the same time, which materials would be practical for fences. We give you more value for your money when designing and building fences. If you want to transform your outdoor living space with the right fence, contact Creative Earthscapes today. We can be reached at (614) 322-3333. We would be happy to give you a free quote and design options. Although we are located in Columbus, Ohio, our fences are legendary around central Ohio, including Granville, Hilliard, Bexley, and Dublin.